Trailer Plug Wiring Adapter Flat 4 to Round 7 blade Connector Curt part 57240. 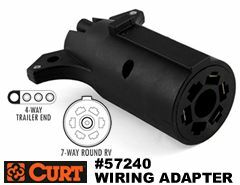 This Curt 57240 trailer wiring adapter converts the standard flat 4 wire harness plug to the standard round 7 way blade connector. The trailer wire adapter is convenient for adapting the hitch mounted cargo carrier lighted boxes that have a 4 way flat plug to fit trailer plugs with the round 7 point connection. Replaces old Curt part # I-724.